En intressant samling med japanska anti-brittiska flygblad som man släppte över Indien. Kommer från National Army Museum i Storbritannien. This leaflet was air dropped into Assam, India, in 1944. It shows two contrasting scenes: one of Indians living under English rule, emaciated and starving to death; the other of Indians living under independence, enjoying an idyllic and plentiful family picnic. The scene of starvation probably refers to the Great Bengal Famine of 1943 that left around four million people dead. Written in Hindi it reads 'Beat the devil with sticks and save India'. 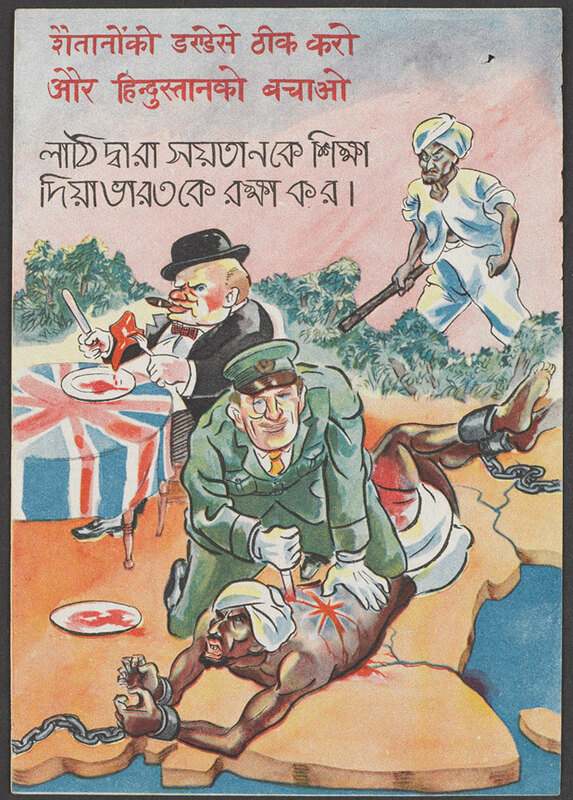 The leaflet portrays an Indian chained to the floor while a British officer is carving meat, in the form of a Union Jack, from his back. The British Prime Minister, Winston Churchill, is pictured seated behind and eats meat in the shape of India. The leaflet was aimed at Indian civilians and encouraged them to fight for their freedom and independence. 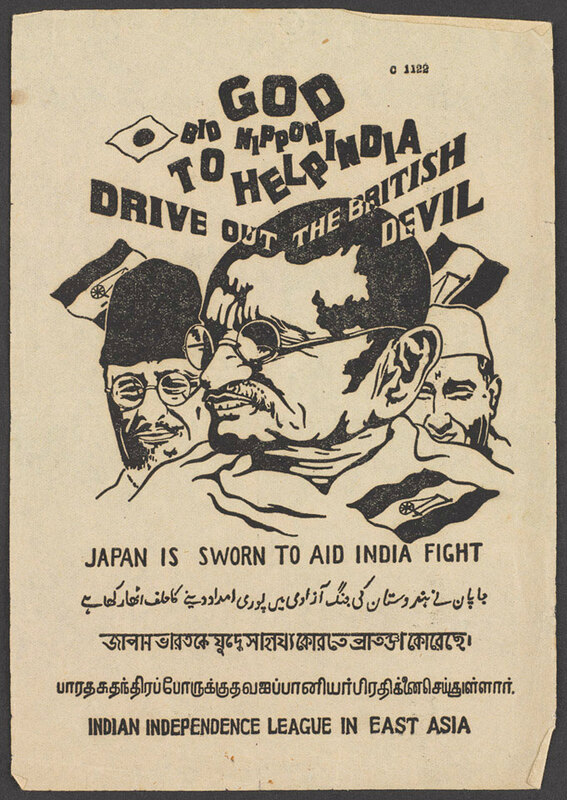 Japanese anti-British propaganda leaflet air dropped into Assam, India, 1944 (c). It is written in Hindi and Bengali, and titled 'Glorious Freedom. Revenge for our blood-bathed history'. The leaflet illustrates an Indian pointing dramatically to the viewer with the shadow of death and decay in the background. The text outlines the repression India has endured for the past 300 years under British rule and gained nothing in return. It encourages Indians to take revenge and makes reference of the Battle of Plassey (1757), the Indian Mutiny (1857-1859), World War One (1914-1918) and the Amritsar Massacre (1919). Japanese propaganda leaflet air dropped in Assam, India, 1944 (c). 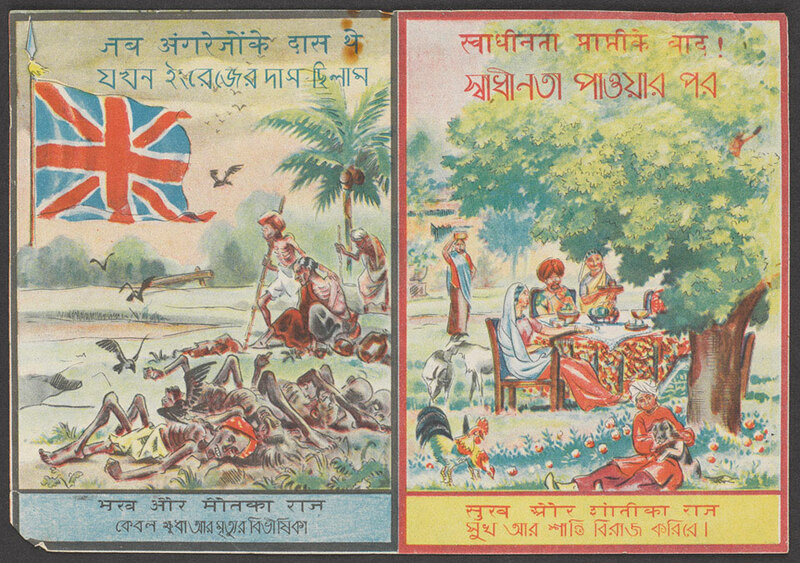 Written in Hindi and Bengali, the text reads: 'The Englishmen are just not bothered about you. You will see this scene everywhere you look'. 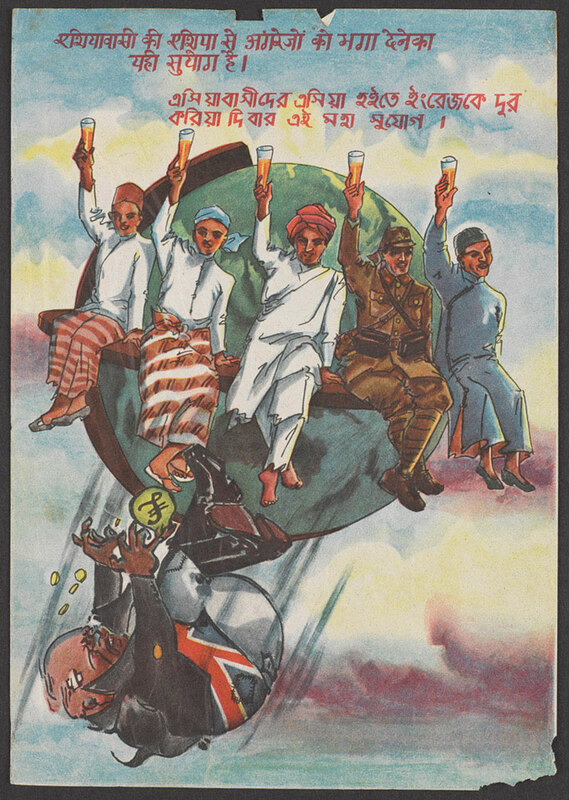 It illustrates how the Japanese wanted Indian civilians to perceive Britain and her allies. 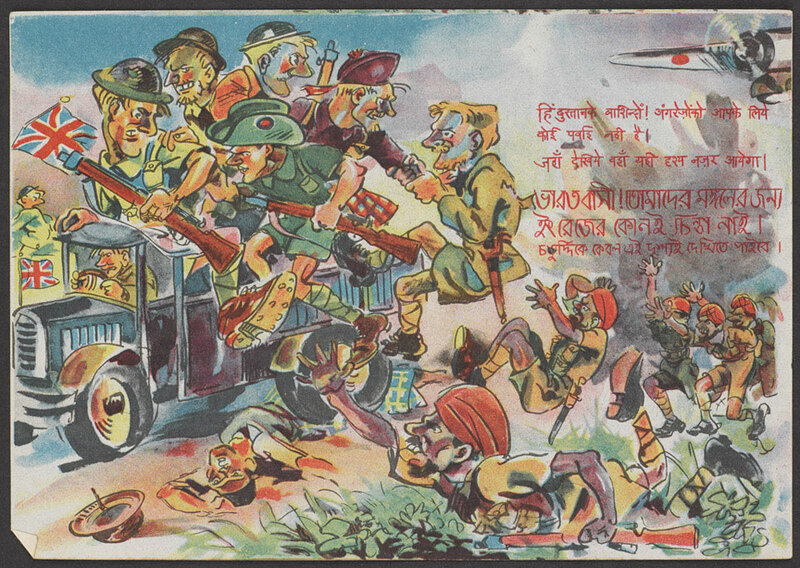 The leaflet shows a military truck occupied by British troops cowardly escaping a bombing by a Japanese aircraft while leaving behind their wounded Indian allies. 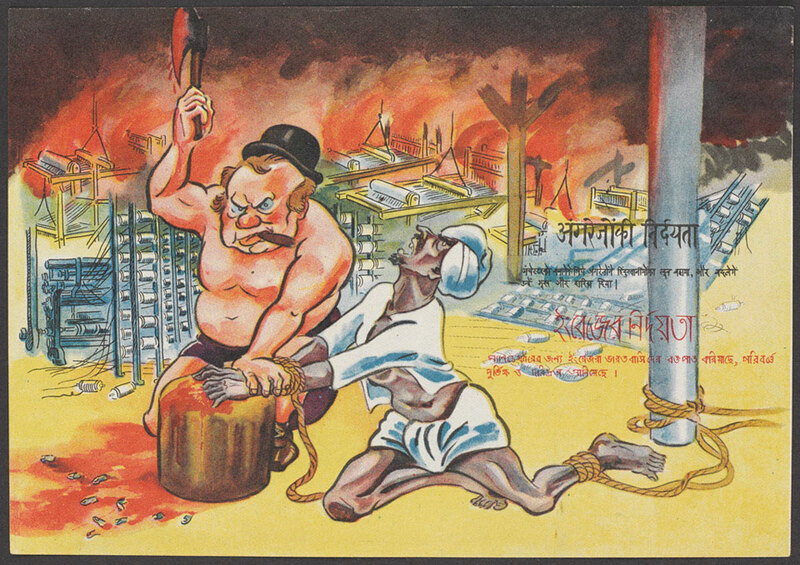 Japanese propaganda leaflet distributed by the Indian Independence League, 1944. The Indian Independence League (IIL) was established to encourage nationalism by unifying Indians outside India against British colonial rule. The leaflet shows Subhas Chandra Bose (on the left), the president of the Indian National Army, which was assisted by Japan. During 1944, Bose had organised the Azad Hind Fauj, primarily composed of Indian prisoners of war. It fought in Burma and even reached Indian soil on 18 March 1944. An inscription in English and three Indian languages reads: 'God bid Nippon to help India drive out the British devil. Japan is sworn to aid India fight. Indian independence league in East Asia'. Japanese propaganda leaflet, 1944 (c). 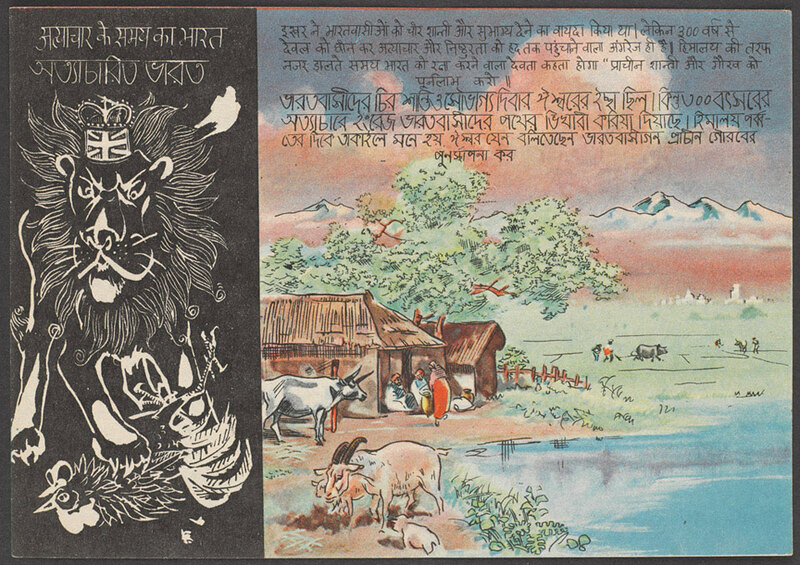 It is written in Hindi and Bangla and reads: 'India at the time of oppression'.It offers two scenes, on the left, it shows the lion the, national symbol of Britain, attacking a chicken, symbolising India. On the right an idyllic pastoral scene in India is shown, suggesting how life could be without British oppression. The text reads: 'The eternal divine had promised Indian natives of perpetual serenity and prosperity. However, since 300 years, snatching divinity and raising oppression and ruthlessness to its limits are solely the English. While having his sight towards Himalayas, the deity who provides protection to India must be saying, "Rehabilitate the ancient peace and pride"'. It represents five different Asian men, including a Japanese soldier, all united and raising a toast. An injured British figure is falling from the globe. The leaflet suggests all Asians can live in harmony. The text reads: 'This is an apt occasion to drive out the English from Asia'. It depicts Winston Churchill chopping off the fingers of an Indian cotton industry worker. The text reads: 'To save Manchester, the British rulers shed the blood of Indians and in return gave them hunger and poverty'. India once had a thriving cotton industry but under British rule this was dismantled by imposing high export duties and importing cheap milled cloth from northern cities like Manchester. As part of the attack on the Indian cotton industry there were also cases of the deliberate destruction of hand looms and even of Bengali weavers having their fingers or thumbs chopped off. India instead became a supplier of raw cotton. This was shipped to Britain and milled into cloth which was then sent back to India where the people were forced to purchase it rather than the local traditional hand woven goods. In 1921 Gandhi established his 'Swadeshi' (self-sufficiency) movement and called on Indians to spin their own cloth or purchase only hand-spun Indian cloth as a rebellion against British rule. 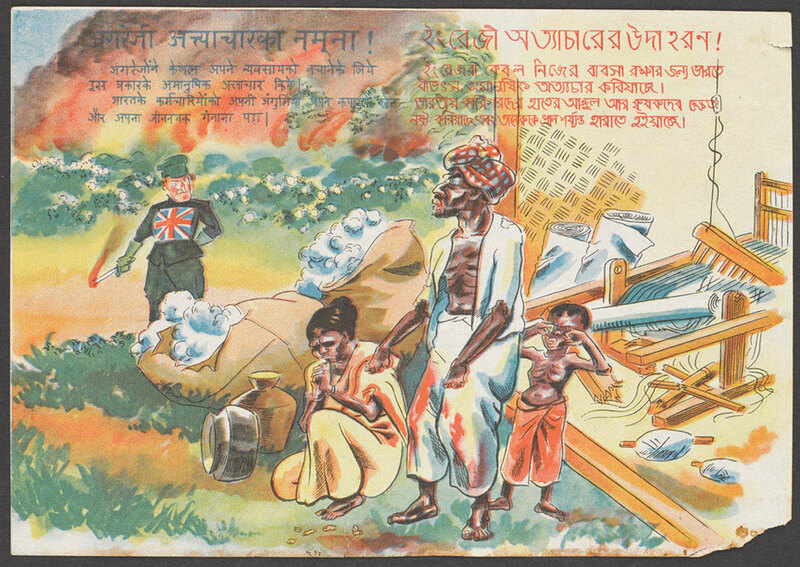 This leaflet makes reference to the Great Bengal Famine of 1943. Following the Japanese occupation of Burma, the Allied forces halted the movement of food in the Bengal region through fear that the Japanese might invade. At the same time large-scale exports of food from India for use in other war theatres and consumption in Britain continued. This resulted in the deaths of over four million civilians. 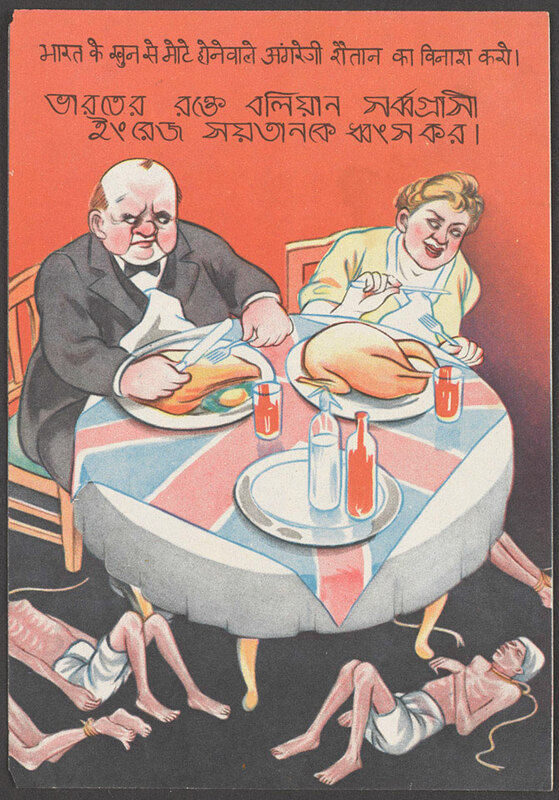 The leaflet depicts a British couple, possibly based on Winston Churchill and his wife, indulging in a lavish meal. Beneath the dinner table lay emaciated and starved Indians. 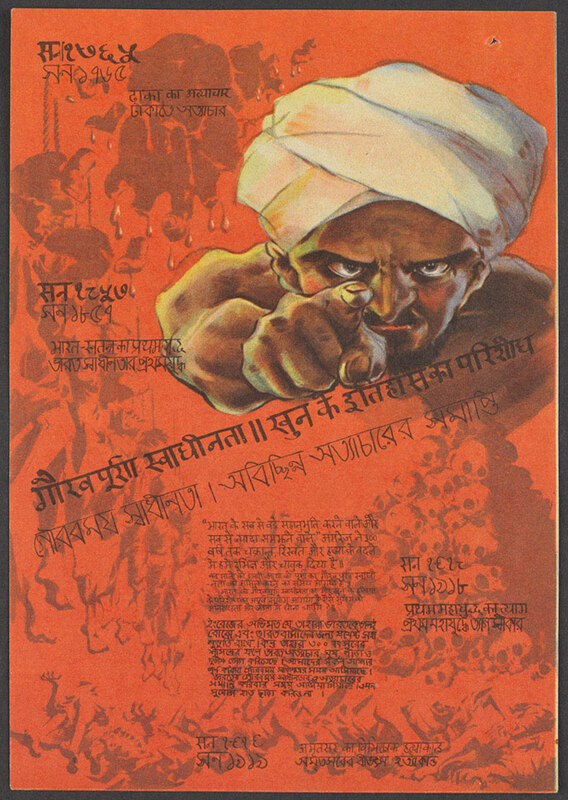 The text in Hindi and Urdu reads 'Kill all the British who are sucking Indian blood'. 'A sample of the British atrocities. Just to save their economy, the British committed this barbarian atrocity. Indian workers had to chop off their own fingers and lose their livelihood'. The Japanese were making reference to the 'deindustrialisation of India'. The leaflet highlights how Britain destroyed the Indian cotton industry by imposing export duties and forcing the population to purchase cheaper milled British cotton. As part of this process there were cases of weavers having their hand looms destroyed or even having their fingers chopped off. Intressant, tack, vadan detta intresse för Indien? Sa de något om effekten? Intressanta bilder, kul att se. Största framgången var nog när man lyckades rekrytera drygt 10 000 av de 40 000 indiska krigsfångarna till INA efter Singapores fall, men annars var japanerna förvånansvärt långsamma att utnyttja möjligheterna. De bör ha haft ett gyllene tillfälle 1942 och början av 1943 när moralen i den brittiska-indiska armén var låg efter reträtten genom Burma och britterna hade fängslat Gandhi, mfl, osv. Totalt fick man ihop ca 20 000 bland krigsfångarna, men vad jag har förstått hade man svårt att få soldater att desertera. Och majoriteten av krigsfångarna förblev lojala trots eller kanske pga att de behandlades lika illa som övriga krigsfångar hos japanerna. För enkelhetens skull kanske vi ska följa Lidls reklamkampanjer som även täcker större delen av Kontinentaleuropa. Tror det är asiatisk vecka nu så det passar iofs bra med Indien och Japan. Både Japan och Tyskland hade intresse av att försöka vända indierna mot den brittiska kolonialmakten. Tyskarna lyckades med lite möda rekrytera runt 4500 man till sin Infanterie-Regiment 950 (indisches) som senare blev en del av Waffen-SS. Att det sedan inte var något Gurkha-material på trupperna är ju en annan historia... Dock hade ju japanerna bättre "underlag" i form av större mängder krigsfångar för att kunna rekrytera till INA. Tack för svar. Men vänligen be mig inte om översättningar från din Indienvecka.